My lifestyle has to do with sports and fitness activities both in my house but in the countryside as well. Whether I am running or cycling and I do these activities very often or, I do fitness and muscle strengthening exercises, I need to have a reliable and multi-function watch. Such a watch would help me both in my fitness activities but in my daily life as a whole, as I always set a schedule in the morning which I have to follow. I am not familiar with the sports watches market. However, I knew what I wanted. I was going for a nice-looking, stylish, bulky and with many features watch. While researching I found the “Casio Men's G100-1BV G-Shock Classic Ana-Digi Watch”. I have to admit that as soon as I saw it, I instantly loved it. But the appearance was not enough. I had to get into every detail of this Casio watch and find out all its aspects whether good or bad. How does the “Casio Men's G100-1BV G-Shock Classic Ana-Digi Watch” work? First of all, I have to say at this point that this Casio G-Shock Classic analog-digital watch for men has amazing look. It is a combination of a digital watch and an analogue watchwith a modern and stylish design. It offers shock resistance which is going to help you with your most strong and dynamic sporting activities. It is incredibly easy for you to use as all the buttons are big and at the right place. Now, let’s focus of its features. The Casio G-Shock Classic boasts an elapsed time mode, dual time for tracking a second time zone, a 1/100-second stopwatch with a 24-hour capacity a daily alarm and of course 12/24-hour formats. This watch also incorporates an auto calendar which is pre-programmed until the year 2039, backlighting with an in-built LED light and a 15-second accuracy per month. It is also water resistant up to 660 feet (200 m.). 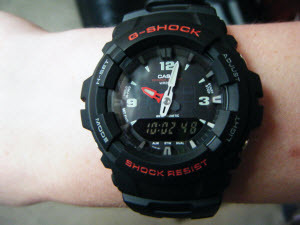 Regarding its size, this Casio G-Shock Classic has a round black watch case which is 1.85 inches (47mm) wide. The black case is matched to a comfortable black strap which also has a stylish and athletic appearance. I have to mention here that anyone who loves diving can use this watch for his recreational scuba diving. Eventually, this is a watch which is ideal for your most strenuous activities. What are other are saying? Does the “Casio Men's G100-1BV G-Shock Classic Ana-Digi Watch” deliver? As I have already mentioned, with the “Casio Men's G100-1BV” watch you have an incredibly solid and rugged device on your hands which is perfect for any outdoor activity. Many of its users are amazed with its high quality materials that it is made. They are also amazed at how “well built and durable” it is. In addition to its amazing athletic appearance, the “Casio Men's G100-1BV” does have excellent features for your everyday life which really make it an “excellent quality watch”. Having a watch on your wrist is very important for you to feel right. The users of this Casio watch have appreciated how “lightweight and comfortable” is for any activity that you are involved. I also have to point out that the “Casio Men's G100-1BV” is a watch that it will never let you down as it presents absolutely “no flaws or malfunctions”. Eventually, what really describes this device is that it is a “tough watch” with an “awesome design” and it is perfect for people who are “active outdoors or working persons”. Below you can watch another review of this Casio G-Shock watch. Will the “Casio Men's G100-1BV” provide me help with my fitness activity? Let’s put the things right here. This watch has been designed and developed exclusively for people who have an active, athletic, vigorous and dynamic lifestyle. Whether you are training at home for weight loss or in the gym or you are enjoying any outdoor activities or extreme sports, this watch is for you. You can “swim, run and workout with it” as it gives a G-Shock feature that it will never betray you and it also gives you each and every timekeeping feature that you may need. You can use it for any water activities including scuba diving up to 200m. I have to acknowledge that the analogue watch which “can be moved only forward” and very slowly is a big drawback but big annoyance as well. As soon as you get out of the country or the Daytime Savings Time comes, you have to change the time but this process is really so slow and so inconvenient. Another downside is that the “buttons are too hard” which may be very frustrating as you have to put pressure on them. Last but not least, the “digital display is small” which really makes it difficult and very frustrating for you to read the digits. Whether you are looking for value or style in a watch or you are fond of a multi function watch then, you do not have to look any further. The "Casio Men's G100" encourages and motivates you to exercise and keep on exercising until you have successfully completed your workout session. 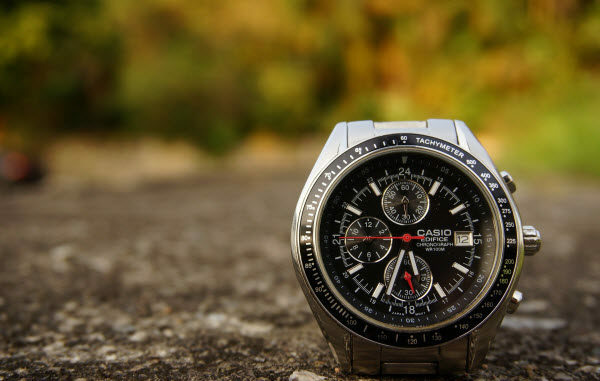 This Casio watch comprises many significant assets in one and only single device and it is the right one for you whichever activity you are involved in. 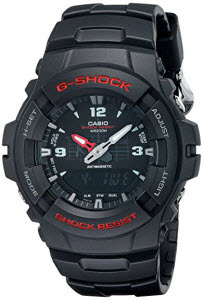 With the “Casio Men's G100-1BV” you get a water and shock resistant watch that it also looks good. You also get a strong-looking watch that is very lightweight at the same time. 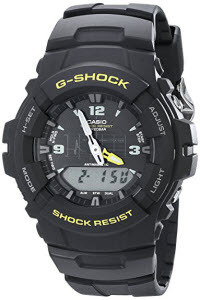 There is no doubt that the majority of the users of the “Casio Men's G100-1BV G-Shock Classic Ana-Digi Watch” like it. It is remarkable that the average customer review gave this watch a 4.5 star rating out of 5.0. I also need to mention that out of 195 reviews, 98 of them gave this watch a 5-star rating and 63 of them a 4-star rating. You can buy “Casio Men's G100-1BV” watch at a great price on Amazon.com. In amazon, there are additional reviews for you to go through and get a better picture of this watch.